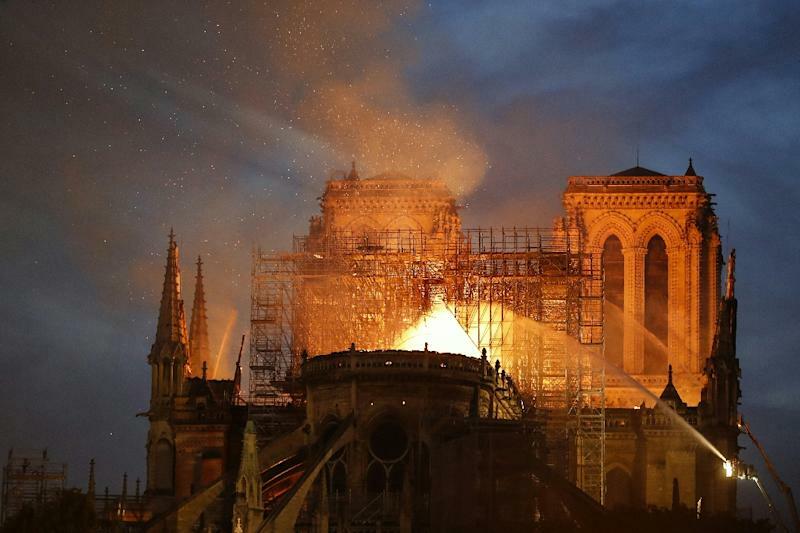 Paris (AFP) - Notre-Dame Cathedral, ravaged by a huge fire which toppled its spire Monday before the gaze of shocked and helpless Paris residents and tourists, has been much beloved yet also neglected down the centuries, says a French historian. Middle Ages specialist Claude Gauvard, also the author of a book on the Gothic masterpiece that dates from the mid-12th century, told AFP there was no overstating the site's cultural resonance. Notre-Dame "is a symbol of Paris, a symbol of peace, togetherness and concord... which occupies an exceptional site at the heart of the city." It is also kilometre zero -- the spot from which all distances to other cities from the French capital are measured. "For me it is perhaps one of the most harmonious of cathedrals, symbolising at once the work of the craftsmen who built it -- though through the ages it has been much loved and yet unloved." Gauvard explained: "Notre-Dame de Paris is much loved by the millions of French people and foreigners who visit each year -- yet they enter and go out again, I am sure, without quite understanding just what this cathedral is." "It was much mutilated during both the Renaissance and the 18th century -- for example, they didn't hesitate to hack away at the main entrance to get through the king's dais! "It needed all the 19th century labours of Prosper Merimee, Victor Hugo, (Eugene) Viollet-le-Duc and (Jean-Baptiste) Lassus which allowed the Gothic art to be restored to its rightful place." "The ongoing works finally got started -- and it was high time, and perhaps even a little late. "I went up to the foot of the spire (before the renovations began) and some of the brickwork was disjointed, held in place by a grate to prevent it falling..."
As to whether the imposing site can be restored following Monday's inferno, Gauvard observed that "the fact the spire has toppled is not so serious as we shall reconstruct it in accordance with Viollet-le-Duc's blueprint, which I greatly respect because without him the cathedral would no longer be there. "It was he who constructed the spire as it crumbled in 1792 -- though that was not in connection with the French Revolution. "Yet there will no longer be this 'forest', this magnificent wooden frame which held up the roofing... That's my fear; that the fire will reach the interior of the choristry." "Notre Dame's problem is that it comes under several jurisdictions: the Archbishopric, Paris, historic monuments, etc. That complicates its maintenance. "I hope that national, indeed international donantions will be forthcoming to finance the restoration as it's going to be very costly."